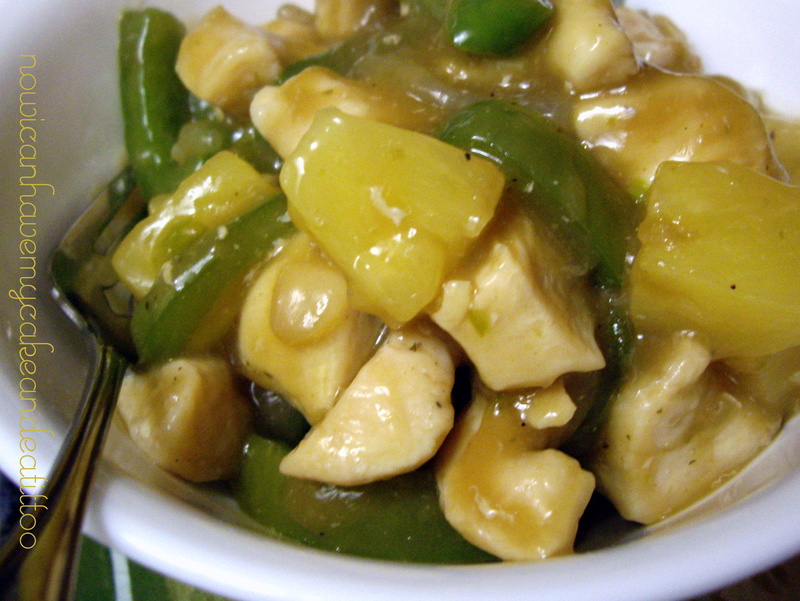 Sweet and Sour Chicken – Now I Can Have My Cake And Eat It, Too! I love sweet and sour chicken. It’s a dish I like to get when whenever we go out for Chinese. The problem is, it’s usually breaded and has sugar in it. So I was super excited when I found a recipe for sweet and sour chicken that had neither. Cut the chicken into chunks and cook in a big pot. Slice onions into rings and bell peppers into strips or chunks. Drain the juice from the can of pineapple chunks, saving it and set aside. Add the veggies to the chicken, season with garlic salt and pepper and cook for 10 minutes. To make the sauce: stir the THM brown sugar (or other sweetener) into the pineapple juice. Add the vinegar and soy sauce. Stir the sauce while you add the xanthan gum (or cornstarch). Pour the sauce over the chicken mixture and add the pineapple chunks. Allow to simmer for another 8-10 minutes and add water if needed to thin the sauce down. You can serve your sweet and sour chicken over cooked brown rice, if desired. Enjoy this yummy Asian dish!! My whole family really like this sweet and sour chicken. I recommend you try this. For all my THM friends, this is an E meal. So keep your fats under 5g and your carbs 20-45.